Plantronics HW520V Headset - Headsets Direct, Inc. 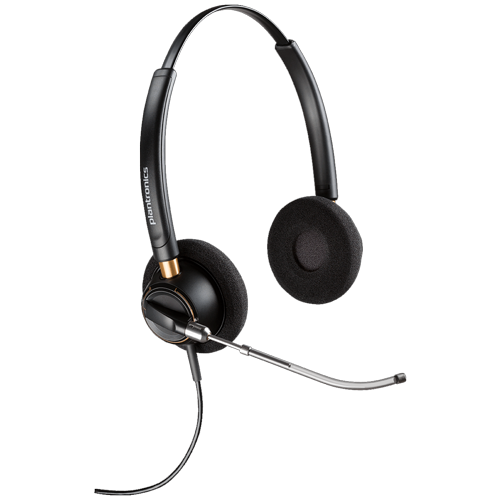 The Plantronics EncorePro HW520V corded headset is one of the new EncorePro line of Plantronics headsets. The HW520V is a dual-ear headset with a headband over the head. The headset has soft, foam ear cushions, and the headband is adjustable, so you can fit it to your head perfectly. The V in the model number indicates the headset has a voice tube instead of a noise-canceling microphone. The voice tube actually picks up your voice and transmits it to the microphone that sits on the circuit board by the speaker. The voice tube rotates forward and back, so you can choose if you want the voice tube on the right side or left side. The tube also telescopes, so you can slide it forward and back for that perfect mic positioning. This headset works well in an average-to-quiet office environment. The louder your environment, the more you may want to look at the HW520, which is the same model, but uses a noise-canceling microphone instead of a voice tube. Covering up both ears really helps you stay focused, and that’s the important thing with a dual-ear headset. You’re not distracted by anything going on around you, and you can really concentrate on your caller. It also balances the sound, and that’s what I enjoy about a dual-ear headset, so I have the sound coming equally to both sides. The headset comes with a clothing clip, so you can clip it to the edge of your shirt or your collar, and that way when you pull on the cord, it’s pulling at the clothing clip, and not pulling the headset, so it keeps the headset perfectly positioned all day. One more thing that is very important to know, the headset ends in what is called a quick disconnect. This is what allows the headset to be used in any application. The headset cord does not physically plug into your phone, you need either a quick-disconnect cord or an amplifier to connect to your phone. So when you want to move around, you don’t have to remove your headset, you simply disconnect the cord and then reconnect the cord when you return, leaving the headset in place. This makes the Plantronics HW520V headset very universal; you can use this headset on any application, you just need the right bottom cable or amplifier. That is why the most important thing to do before you purchase this headset is to give us a call and tell us what your application is; if you are plugging into a desk phone, PC, iPhone, Samsung, or a tablet. Then we can tell you which cable or amplifier will work for you. The cables and amplifiers are always sold separately, so you can get the right one for your application. The Plantronics EncorePro HW520V is a good business-grade headset, made for the office environment that is on the quieter side. It has great sound quality; you’ll really enjoy using this headset. if you have any questions on this or any other models, please give us a call at 1-800-914-7996, or visit us online at www.headsetsdirect.com.